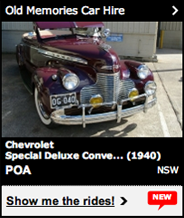 Be part of Australias only and largest website for all rides for all occasions. Generate more direct leads for your business today and let us help you connect with 1000's of online users with events. 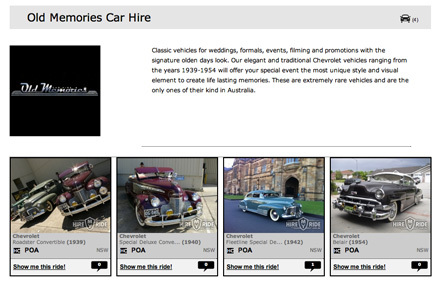 Manage your rides photos, details, prices, categories, availabilities plus more! Manage your rides calendar, view bookings, update your rides availabilities plus more! View stats on your rides, how many views, bookings, likes and income earned. Create your custom website URL and share with your firends and clients! Receive instant email inquiries with details of the event for you to accept or decline. Receive instant SMS enquiries and never miss an opportunity! Have your rides appear on the home page and gain more online exposure! Enhance your rides listing to help you gain more work! High alert black box preview design - Helps you stand out from the others! Applies to all your rides! 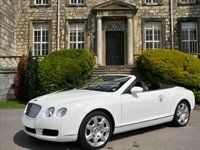 Featured listings can only be purchased once you have listed your rides with us. Hire My Ride charges a small fee to the total cost of the enquiry. This is paid by the person(s) making the enquiry. Once this has been made you will then be connected directly to them to finalise your deposit and any further booking details. * Home page listings and top of search page listing are randomly generated. There may be times where the ride listing will not display on the home page, this is due to the high amount of featured rides. Become an official Hire My Ride partner & have your companies full details and profile listed online & gaine more leads! All your rides are listed as featured rides along with your company name. To find out how you can become a partner or for, more information, contact is today! We accept Visa®, MasterCard® credit card and Paypal payments only via our online payment facility or over the phone with a Hire My Ride team member. Please be sure to provide the exact billing address and telephone number that your credit card issuer has on file for you. Incorrect information may cause a delay in the processing. Hire My Ride Pty Ltd uses the eWAY Payment Gateway for its online credit card transactions. All online credit card transactions performed on this site using the eWAY gateway are secured payments. All listing fees and advertising fees are non-refundable. All booking deposits are Non-Refundable unless a reasonable circumstance is presented. Bookings are confirmed when the Ride Owner Accepts a booking request via SMS or online and the hirers booking deposit is authorised in the payment gateway. All booking deposits are Non-Refundable unless a reasonable circumstance is presented. Either the Hirer or the Ride Owner may cancel a booking at any time prior to the commencement of the event subject to a cancellation penalty payable to Hire My Ride Pty Ltd. If the Ride Owner / Operator is the cancelling party they could be suspended from the hiremyride.com.au website. If the Hirer is the cancelling party, he or she will forfeit to Hire My Ride Pty Ltd their booking deposit unless a reasonable circumstance is presented. If a Vehicle is rendered unusable for any reason that results in early cancellation then the deposit becomes fully refundable to the hirer and they have the options to re-book using the www.hiremyride.com.au website.